Washington, DC – June 21, 2016 — For the past year or so, various media outlets have framed unflattering stories about manufactured housing around the premise that the industry’s lending practices unfairly gouge people of modest means, and that Dodd-Frank regulations have failed to protect them. But during that time, in a parallel universe, lawmakers and regulators have engaged in earnest discussions that support an entirely different conclusion: The misguided implementation of this well-meaning legislation is hurting buyers, sellers and lenders in the critical manufactured home market, which HUD Secretary Julian Castro has said is so important for affordable housing. This ongoing discussion in Senate committees is available to anyone with access to C-SPAN; it suggests that business and financial reporters might want to re-think past stories on this issue and set the record straight. Regrettably, media accounts like The Seattle Times/Center for Public Integrity/Buzz Feed and The PBS News Hour are riddled with misleading or inaccurate information. 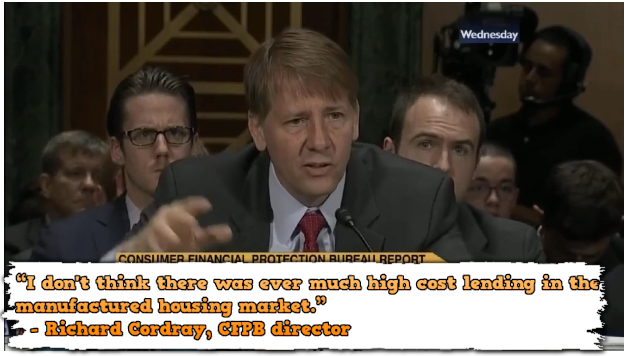 In recent years, the bulk of in-depth news reports and expert analysis on the impact of federal regulations on lending have been originated by MHLivingNews.com and MHProNews.com. With the affordable housing crisis growing, there is an urgent need for fresh, accurate reporting that shines a light on the unfortunate consequences of federal rules that were well intended, ended up hurting the very people they were meant to help. Photo caption – a still from the MHLivingNews Inside MH Road Show video, which includes video from U.S. Senate hearings carried on CSPAN2, as shown. MHLivingNews.com and MHProNews.com are the leading trade publications for consumers and MH industry leaders, investors, public officials and advocates who want up-to-date lifestyle and business news.